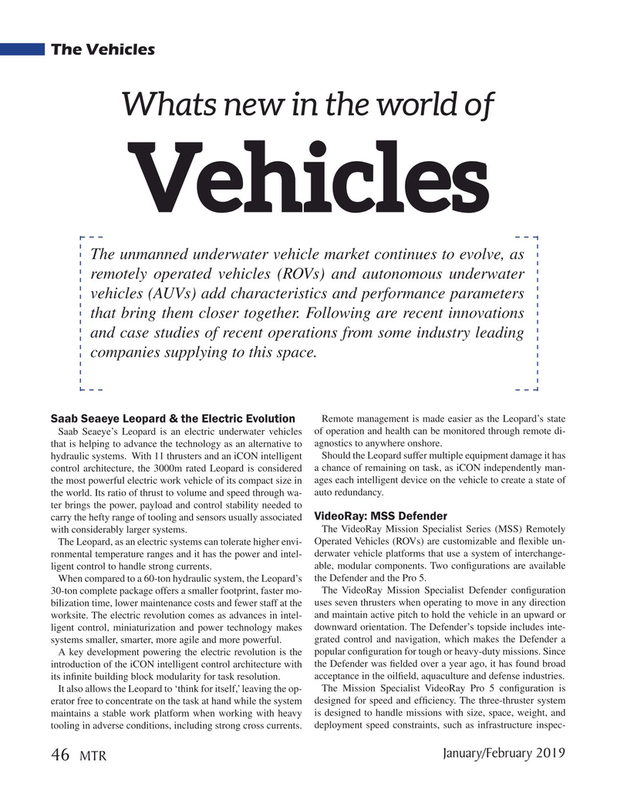 The unmanned underwater vehicle market continues to evolve, as remotely operated vehicles (ROVs) and autonomous underwater vehicles (AUVs) add characteristics and performance parameters that bring them closer together. Following are recent innovations and case studies of recent operations from some industry leading companies supplying to this space. Saab Seaeye’s Leopard is an electric underwater vehicles of operation and health can be monitored through remote di- that is helping to advance the technology as an alternative to agnostics to anywhere onshore. hydraulic systems. With 11 thrusters and an iCON intelligent Should the Leopard suffer multiple equipment damage it has control architecture, the 3000m rated Leopard is considered a chance of remaining on task, as iCON independently man- the most powerful electric work vehicle of its compact size in ages each intelligent device on the vehicle to create a state of the world. Its ratio of thrust to volume and speed through wa- auto redundancy.